The use of a factory service manual is highly recommended. These can be downloaded online at http://techinfo.subaru.com. The use of penetrating oil will greatly reduce the chances of galling threads on bolts as they are removed. We highly recommend the use of anti;seize on treads of all bolts, when reassembling. 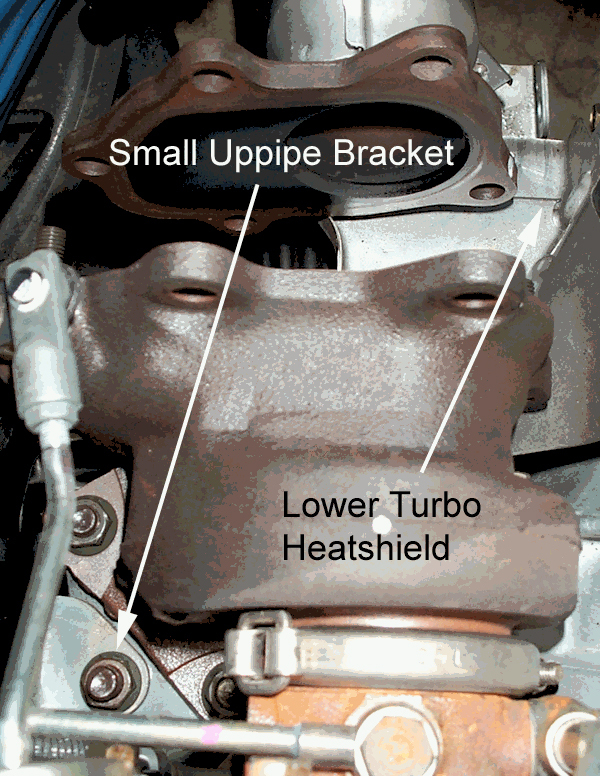 It is vitally important to loosen turbo support brackets before uppipe is tighten down to header. Its vitally important that these brackets get tightened back down only after uppipe is tightened to header. This ensures no stress is being put on uppipe that can cause premature failure. It's also vitally important that your downpipe has not been damaged, and or fits properly before installation. An improper fitting downpipe can be "forced" to install onto car, but will cause premature failure of uppipe. These above models contain OEM catalytic converters in their uppipe, and it is NOT legal for use or installation within the United These above models contain OEM catalytic converters in their uppipe, and it is NOT legal for use or installation within the United States on those applications. However, Canadian, Japanese, European and other markets may allow for replacement. Contact your local government prior to ordering for these areas. For those installing this part on race cars, there is an EGT sensor that is installed into OEM uppipe. This part has been proven to fail and destroy turbos in racing applications. We purposely eliminate the EGT bung to prevent turbo failure. A CEL will occur after installation of Uppipe in this situation, unless a 2.2Kohm resistor is installed across OEM female plug. These can be found at most any RadioShack. 1. Raise front wheels off the ground. The vehicles weight must be supported by jack stands. Death or serious injury could result from an improperly supported vehicle. 2. Remove lower plastic splashguard to gain access to the exhaust system from under the car. This step varies from older to newer cars, but normally there are (3) 10MM BOLTS AND 4 POPITS to remove. 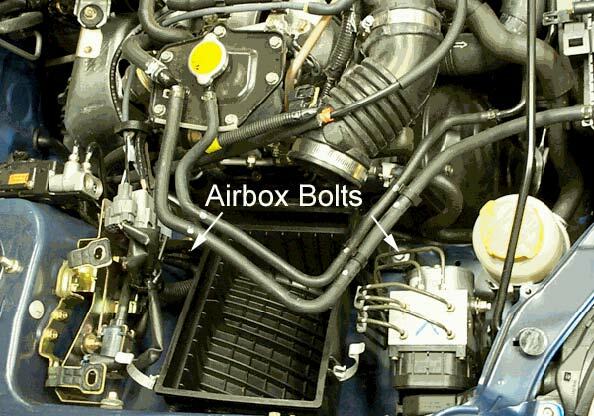 Newer cars have fewer fittings. 3. Remove air filter and air box for access to 02 sensor wire holder bracket. (2) 12mm bolts down low on chassis secure air box. 4. 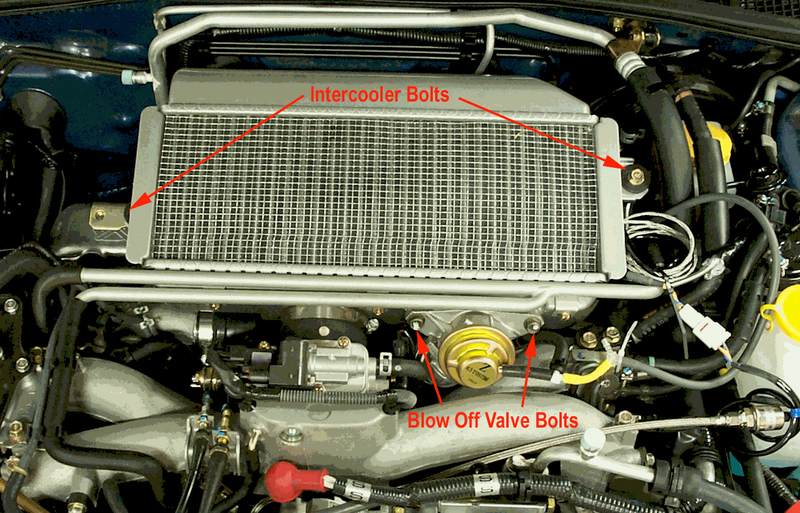 Remove intercooler from engine by removing blow off valve (2) 12mm bolts then remove (2) 12mm bolts on either side of intercooler and the hose clamps that attach intercooler to the turbo and intercooler. Carefully remove by pulling back of intercooler up and out. 5. Remove passenger side intercooler bracket (2 12mm bolts) located on engine. 6. 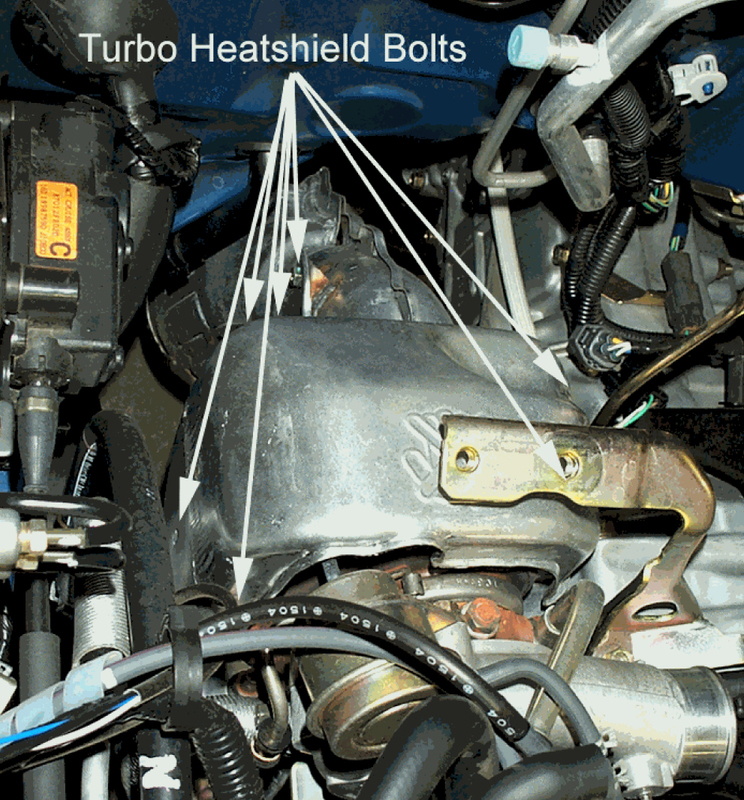 Remove upper turbo heat shield by removing (7) small 10MM bolts around turbo. 7. Remove rear 02 sensor from downpipe using o2 sensor wrench. 8. Remove down pipe (stock downpipe is made of 2 pieces). (5) 14mm nuts at turbo, (1) 14mm bolt on transmission case, and (2) spring bolts at downpipe to catback connection. Leave downpipe in one piece. 9. Remove lower turbo heat shield mounted to factory up-pipe with (2) 10mm bolts. 10. Remove small access panel in passenger side, wheel well to access front 02 sensor. Remove 12mm bolt mounted on #3 cylinder coil. This will make removal of the Oxygen sensor easier. Remove 02 sensor with 02 sensor wrench. 11. Remove lower passenger side exhaust manifold heat shields. (4) 12mm bolts. 12. Remove (3) 14mm nuts that bolt turbo to up-pipe and remove (2) 14mm nuts holding support brackets to uppipe. 13. Remove bolts/nuts on passenger side lower exhaust manifold (3) 14mm nuts, (4) 14mm nuts and bolts combos. 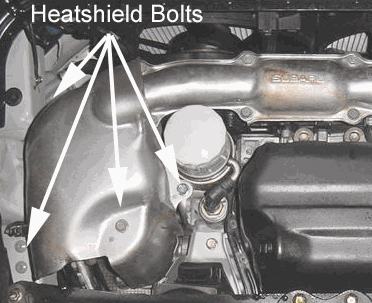 Take notes as to where gaskets are located, and donÃ¢â‚¬â„¢t reuse Remove manifold from engine and chassis. NOTE: manifold can get caught on upipe when removing, take time when lowering down. 14. If car is equipped with EGT sensor in uppipe, locate plug on shock tower, and unplug. The chassis side of harness is where resistor will get plugged into. Trimming of resistor leads will be necessary for installation. 15. Remove passenger side motor mount nut & washer. 16. Use floor jack and block of wood to jack engine up enough for up-pipe to be removed out the bottom. Lift engine approximately 2 inches. If done correctly, uppipe will fall out of car. 17. The motor does not need to be raised for installation of new up-pipe. Lower engine and retighten motor mount immediately after you have removed factory up-pipe. 18. 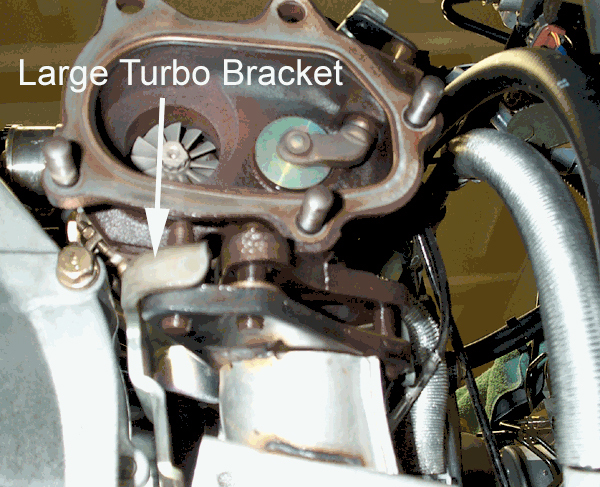 Important Loosen turbo support brackets (small and large) where they connect to engine. These will be re=tightened after uppipe is installed. 19. Install supplied studs into PERRIN up pipe. Place new turbo inlet gasket onto uppipe. Install PERRIN uppipe into the car from the top. Place PERRIN up-pipe into the turbo bracket, using one of the nuts to hold it in place. 20. When reinstalling lower exhaust manifold donÃ¢â‚¬â„¢t tighten all nuts and bolts. Leave them finger tight until all bolts and nuts have been installed. Make sure to install new gaskets as bolts are being re-installed. Make sure to align uppipe with exhaust manifold before tightening bolts. 21. Important: Torque the nuts and bolts in this order: Manifold to up-pipe (2) 14mm bolts (38ft-lbs) - Manifold to cross over pipe (2) 14mm bolts (38ft-lbs) - Manifold to block (3) 14mm nuts (38ft-lbs) - turbo to up-pipe (3) 14mm nuts (38ft-lbs) - Small/Large turbo bracket (2) 14mm nuts (38ft-lbs) - Small/Large turbo bracket where they connect to engine (20ft-lbs). 22. Reinstall lower manifold heat shield, and proceed to reinstall remove parts in reverse order starting with step #11. 23. After installation is complete, start car and listen for exhaust leaks. If leaks are present re-check install and replace gaskets if needed.